My current most used face masks featuring Omorovicza, Image Skincare, Christian Breton & more! I'll start with my favourite mask: Omorovicza Midnight Radiance Mask, which I have almost finished already! When I first received this mask, I was unsure if the Salicylic Acid it contains would suit my skin as it is generally recommended for oily skin. Salicylic Acid is a BHA, and it can penetrate pores more deeply than AHAs so really gives the pores a very deep clean. On its own, this would not be ideal for dry skin but because it is combined with the moisture-locking ingredients that are Red Alga and Sodium Hyaluronate, it works really well. This mask is applied to clean, dry skin and left on overnight. It has a gel texture, that feels slightly tacky on the skin but it isn't uncomfortable and I don't stick to the pillow. This mask is a game-changer! I have been using it 3 times weekly since I received it and in that time, my stubborn pigmentation has faded, my pores are refined, I have had no breakouts, and my skin is soft, smooth and bright. It is expensive at £90, but for the results, it is totally worth it. This is one that I will definitely put on my Christmas wish list and is, without doubt, my favourite skincare discover of 2017! My skin can sometimes react badly to products containing Vitamin C, however there is no doubt that it's a brilliant ingredient for combating dull skin so when I was sent Image Vital C Hydrating Enzyme Masque, I was both excited and anxious to try it. The instructions say that it can be left on the skin for 5 to 30 minutes, but for me, 10 minutes is ample - I started with 5 and built up to 10. It also say that it can be used daily on very dull skin but I use it once weekly and the result is glowing skin. Once weekly, I also like to use a clay mask and it is currently Nia Sunday Detox, which I reviewed in full here. It is a peel off, deep cleansing mask that doesn't dry the skin out. I like to follow it up with a sheet mask & I am currently using Christian Breton Anti-Wrinkle Facial Mask. These masks are absolutely saturated in serum - an entire bottle, in fact, so it feels instantly soothing and hydrating. Whilst I can't say that my skin is firmer because I have only used two of these masks so far, I can say that my skin feels comfortable, is plump and hydrated after use. For nourishment I use two masks - the first is Trufflesque Ultra Hydration & Radiance Masque, which is like a facial in a jar! I apply it to clean, dry skin and then leave it to work its magic for 15-20 minutes, before massaging in and leaving to work for another 3 minutes before removing with warm water and a flannel. It contains black truffles, gold peptides and a fruit and amino acid complex - the result is glowing, plump skin. It is the perfect pick me up before a special event as it really does leave the skin looking like I've had a facial. The second nourishing mask is Clarins SOS Comfort Mask, which can be used in two ways - as a quick fix, 10 minute moisture injection or as an overnight mask, which is my preference. It is a nourishing balm mask, infused with mango oil that feels like a hug for the skin. When I use this overnight, I wake up to comfortable, soothed, nourished, plump skin. 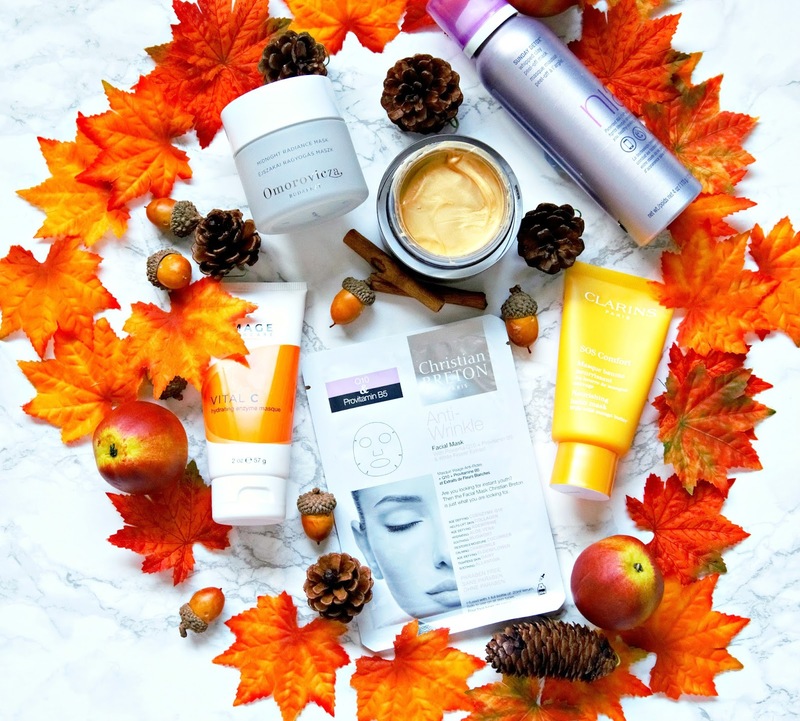 Have you used any of these masks? I'd love to hear what your favourite masks are at the moment? All products are bought by me, unless otherwise stated. All of these masks were sent to me but opinion is always my own.